This is recommended for more advanced users of Airbnb. 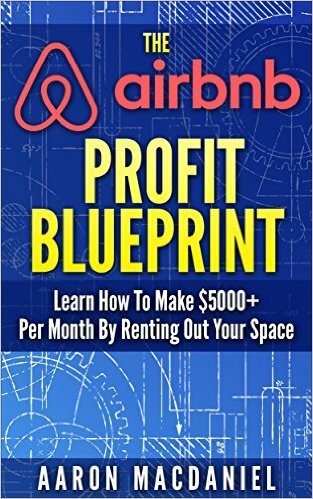 Once you get the hang of running your Airbnb, you may be looking for ways to invest in your second Airbnb unit. Or perhaps you just want to spend less time managing your current Airbnb unit so you can be free to work a job, go the beach, or spend more time with your family. Whatever you motivation, once the newness of Airbnb wears off, most people start looking for ways to run things more efficiently. Luckily for you, there are a variety of options once you get to this stage. I am going to start this article in descending order of price: most expensive option first. Any other these are great options to spend less time running your business, and more time enjoying your life doing whatever it is you want to do! In a time and place not too long ago, this used to really be the only option besides do it yourself. There are still a variety of Property Managers and or Realtors (not always the same thing) who run companies for exactly this reason. They can usually handle everything in your operation, from finding your potential guests and answering their questions, to helping with check-in, and arranging the cleanings etc. Sounds great right? Well for many people, they really are. This is the totally “hands off” approach where, assuming you find a good manager, you can just sit back and not worry about a thing. Just get a check at the end of every month. The big downside really only comes down to two things: Price and Control. When you hire a Property Manager (PM), you give up a lot of Control over your unit. Your PM will choose which guests stay in your place, which cleaner cleans the rooms, and even sometimes collects the money for you and send you an accounting statement at the end of the month. For some owners, they don’t want to give up this level of control. For others, when they find a good PM they can trust, it is totally worth it and it is not an issue. They key here, obviously, is finding a good PM company that understands your needs and looks out for your interests. The main issue with a traditional PM is price. They often charge anywhere from 15-30% of monthly revenues (and 15% is a pretty good deal if you find a good one) to manage a short term accommodation like an Airbnb unit. Of course, its a lot of work, and you will pay dearly for it. A VA is somebody, most likely in Asia, who can work for you part time or full time, totally remotely. They can handle things like email, scheduling, marketing, etc. They are a good choice to help manage your AirBnB because all communication can be done online and via the phone. Many VA’s will have access to use a US phone number or call US numbers if required. For a little more money, you can also find a VA, who speaks good English and can take calls for you as well if you want them to handle that part of your business. The Philippines has taken off as the VA capital of the world due to low prices, great English ability, and decent internet connectivity. An email only VA should run you $300-$500 USD a month. A VA with good English and who can take and place calls for you should be in the $500-$700 a month range. You can find VAs on sites like Upwork.com as well as Craigslist. If you want to take some of the work of managing your Airbnb unit off your shoulders, a VA can be a good option. Again, as in most hiring, finding a good one is really important, as you will likely have to give them your Airbnb user name and password. So you better find a trustworthy one if you go this route. However, if you do find a good one, they can manage a lot of the routine questions and communications that you need to be on top of for your vacation rental listing. Also, due to the time difference, you can have them provide “coverage” to approve stay requests and answer questions even while you are asleep! Their daytime is usually night time in the USA (depending on where you are located), and many VAs will tailor their schedule to any hours you like. So have them take the “night shift”, and you can increase your response rate and decrease your response time, while hopefully picking up a few extra bookings in the process! Obviously I like VR Front Desk the best of all the options. Sure, a bit biased you may say, but you are reading this article on VR Front Desk after all! Of course, I encourage you to do your own research and find the solution that works for you. There are going to be pros and cons of every service. 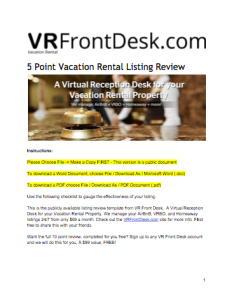 VR Front Desk can be your “Front Desk in the cloud” and handle your listings, with all the same benefits of hiring a VA above, but none of the risk that comes with using an unscreened VA. They only hire trained professionals and all are carefully audited to make sure they follow the owners instructions perfectly. A lot less risky compared to hiring your own VA. They can manage any platform (Airbnb, Homeaway, VRBO, Flipkey, etc) where you have a listing, and they charge only a small percentage (3-5%, depending on what you need), so pricing is a lot clearer. The best part is that VR Front Desk is open 24×7 and can respond quickly to every request.That boosts my response rate and has helped get me to the top of the AirBnB listings. I recommend you check them out and decide for yourself. Do you have VAs that assist renters in obtaining the perfect Airbnb home for their needs? Sorry we don’t help with searching of Airbnb places for rent, only with management of Airbnbs for owners and hosts. Can your service send condo property management, form information for Airbnb guests in addition to virtual management of Airbnb businesses. Yes we can do that, many condos require guest registration and we can handle that by sending the resident manager the guest info either ahead of time or on the day of check-in to meet condo rules and regulations.